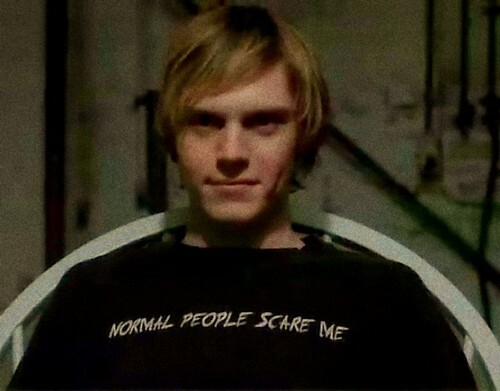 Normal people scare me.. Tate ;]. HD Wallpaper and background images in the अमेरिकन हॉरर स्टोरी club tagged: american horror story season 1 fx tate langdon evan peters. This अमेरिकन हॉरर स्टोरी fan art contains जर्सी, टी शर्ट, चित्र, headshot, closeup, हेडशॉट, and क्लोज़अप. There might also be पोलो शर्ट, खेल शर्ट, अवकाश पहनते, अवकाश पहनना, dashiki, daishiki, दश्की, and डेशिकी.